Your wedding is one of the biggest celebrations of your life and having the people you love most by your side is what makes the day so sweet. For the VIPs in your life who can’t witness your wedding in person, here are four ways to honor and include them from afar. Paying homage to the people who have shaped us never goes out of style. To honor a loved one in your life who now lives on in your heart, incorporate something from their wedding day into yours. While wearing a relative’s wedding gown is an obvious option, there are plenty ways to get creative. For vintage with a twist, we love Great Lakes Gowns line of custom couture jewelry designed around a piece of lace you provide. You can also ask your tailor or gown shop to sew a small pocket in your dress to hold a special ring or keepsake. Broadcasting nuptials isn’t just for royalty anymore. 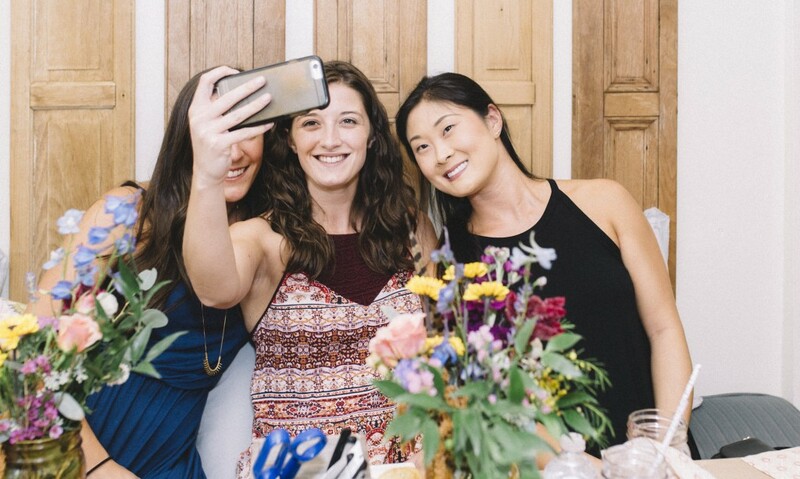 Whether your family is spread around the world or your BFF is going into labor any minute, live streaming your ceremony is the best way for your friends and fam to avoid FOMO. What you’ll need: a webcam, internet connection, tripod, and a few guinea pigs to test the connection and camera angle before the ceremony. Designate physical space for loved ones who have passed away. 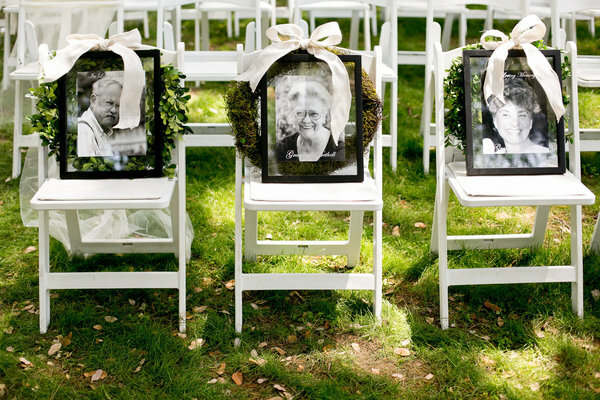 Place framed photos on chairs at your ceremony or reserve a decorative table at the reception. On the table, include a sweet poem or note from the heart. For a more spiritual approach, light a candle or release lanterns in their honor. Finally, cut a rug to their favorite song or the song that makes you smile when you think of the best times you spent together. Whether you can’t make it or just can’t wait to be there, sending a group video is a meaningful and authentic way to show your love. Coordinate the gang with Tribute, a video editing platform that makes it easy to create collaborative video montages. From freemium to “the works,” they’ve got you covered. You can also go the gratis route by nominating your most organized friend to collect videos in a DropBox folder. Lights, camera, best gift ever! 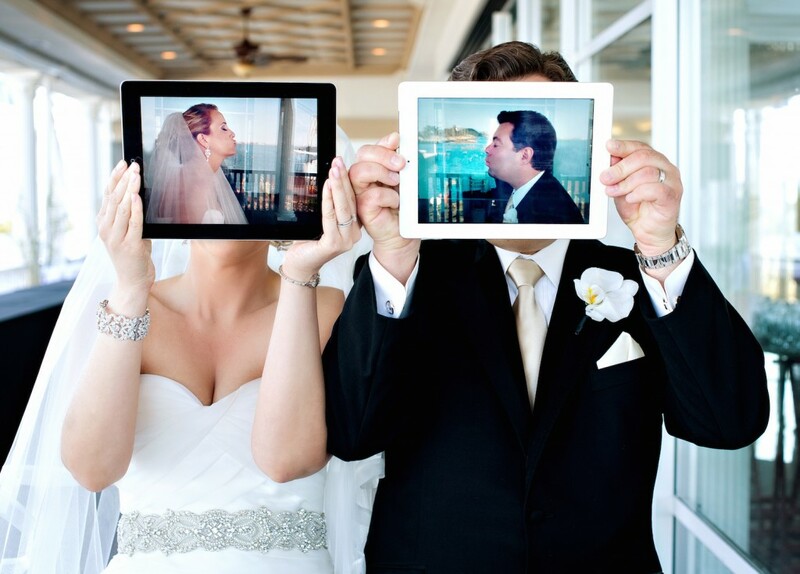 No matter where your loved ones are on your wedding day, remember they’ll always be with you in your heart.